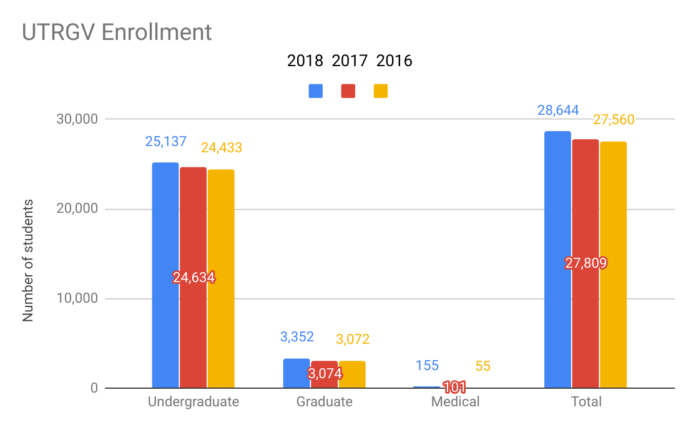 EDINBURG — The final enrollment numbers are in for the University of Texas Rio Grande Valley and this fall turned out to be the highest on record so far for the young institution in all areas. In total, UTRGV saw its largest number of students this fall with a total enrollment of 28,644 officially reported, an increase of 835 students, or three percent, from fall 2017. Hinojosa referred to several changes and adjustments that took place as the university worked to consolidate what used to be two different enrollment departments and processes from its two legacy institutions — UT-Pan American and UT-Brownsville — into UTRGV in 2015. The changes were widespread and included a revamp of the entire application process, a new application system for both undergraduates and graduates and even more personalized assistance to engage those curious about UTRGV’s programs through enrollment specialists. Initial counts prior to census day had the total student count at 29,322 for the fall of 2018, but officials expected the drop, as happens every year, due to students making last-minute changes. The overall growth percentage remained as predicted as well as that for graduate school. The final numbers for graduates enrolled this year at UTRGV peaked at 3,352, about nine percent higher than in 2017 when there were 3,074. This year 3,068 students are pursuing masters degrees, while 284 enrolled in doctoral programs. The number of new undergrads also increased this year to 4,565, representing the largest freshman class in UTRGV’s short history. This includes all students new to UTRGV even if they came with some college credit. Hinojosa said that each year the number of applicants seeking a seat at the university has increased so far as well, going from 12,779 in 2016, to 15,995 in 2017 and finally 16,337 in 2018. The more rigorous application and acceptance process implemented by the university during its first year was intended to ensure student success without changing the accessibility that UTPA or UTB were known for. Out of the 16,337 new students that submitted an initial application, 10,931 fully completed the application process, 9,072 were admitted into UTRGV and 4,565 fully enrolled. This drop is due in main part because students have been accepted to several institutions or simply change plans before the school year starts. The next step is to check where these students went to keep track of which institution UTRGV might be losing students to. And this happens in November once all institutions across the nation have completed their enrollment reports. But Hinojosa said so far UTRGV has a 50 percent yield in college admissions — which refers to the percentage of students who actually enroll after being admitted to a particular college — while the national average is at 32 percent.